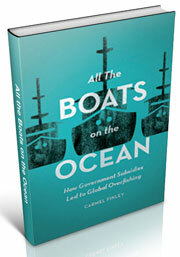 With All the Boats on the Ocean being published in February, it’s time to think about how to carry on the story of the development of fisheries and fisheries science in the Pacific. I always thought I’d need a trilogy to tell the whole story. All the Fish is about the 1930s to the 1950s. All the Boats brings that story to 1976 and the global expansion of territorial seas to 200 miles. All the Science will bring the story to the present, more or less, or at least that is the current plan. Of course, there may be some glitches, such as my working title (I am assured the Press is going to want to change it, generally speaking you don’t put words like “science” in titles if you hope to sell books). And who knows what an ear stone is? An ear stone is a bony growth in a fish’s ear. The proper name is otolith. They are hard, calcium carbonate structures located directly behind the brain of bony fish like Sebastes alutus. They help with balance, orientation, and sound detection-much like the inner ear of mammals. Sebastes alutus, as all our alert readers know, is better known by its many aliases, including Rosefish, Rosies, Redfish, and, more formally, Pacific Ocean Perch or POP. The blog can really be said to be all about Rosefish and how they were almost eradicated by the Soviet factory processing fleets off Oregon in the 1960s. While there has been some recovery of the fish off Alaska, recovery off Washington, Oregon, and California has been pushed back to 2051. To look at the story of the Rosefish, and their unique biology, is a way to trace how fisheries have globalized since the 1960s. has slowly uncovered the life story of these unusual fish. George Yost Harry Jr. Jergen Westrheim, and Dayton Lee Alverson were among the scientists first studying these fish. They suspected they might be be long-lived. 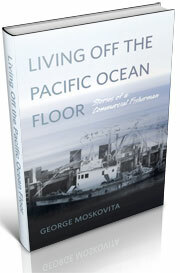 George Moskovita fished for them, delivering the biggest load of his career to an Astoria cannery in 1965. Donald Gunderson was the first to study the impact of the Soviet fishing on the stock. With new tools and technologies in the 1980s, scientists discovered that the fish can live for many decades, some to even 212 years. So the story of Rosefish is a story of the development of science. And that new science is in tension with the fisheries science (MSY) that is at the heart of modern fisheries management today. 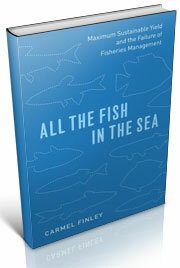 Fisheries are complex. They are hard to write about without being boring. Many of the issues are generally written about in a technical or academic style that is difficult to read. One of the challenges in writing history is making it relevant, and telling a story in an engaging way that makes it easy for readers to follow. One of the best ways to do that is to hook your readers emotionally with the subject matter. So All the Science about a fish, how it got fished, how it got studied, and what it all means to the way we understand our stewardship of the oceans and its fish stocks in the 21st century. I haven’t figured out how I’m going to tell that story yet, but the blog readers will be the first to know. This entry was posted in Environmental History, fisheries science, Fishing, George Moskovita, History of Science, History of Technology, Maritime History, Ocean fishing, Overfishing, Pacific Fishing History Project, Rosefish, Sebastes rockfish, Soviet environmental history, Soviet fishing, Soviet history', World History and tagged otiliths. Bookmark the permalink.